There are various ways that motorcycle accidents can occur. Some of these include rear end accidents, left turn collisions, running stop signs, running red lights, speeding, drunk drivers, out of control motor vehicles and unsafe lane changes. Unfortunately, when a motorcycle is struck by a car or truck, the injuries sustained are nearly always serious or even deadly Brain injuries, fractured bones, paralysis or other catastrophic injuries are all too possible. It’s wise to understand the statistics of motorcycle accidents in order to get a greater sense of the issue as a whole. You may find that your particular motorcycle situation is either common or uncommon, and that information can help you in developing a case. In 2/3 of motorcycle accidents with other vehicles, the driver of the other vehicle violated the motorcycle rider’s right of way and subsequently caused the accident. Motorcyclists are about 26 times more likely to die in a crash than someone riding in a passenger car, and are 5 times as likely to be injured. Studies have shown that certain factors play into an increased likilihood of accidents. These causes are sometimes avoidable and always beneficial if known ahead of time. Failure of motorists to notice motorcycles in traffic is the largest cause of motorcycle accidents. Intersections are the most likely place for motorcycle accidents. Most motorcycle accidents occur during short trips, like shopping, errands, visiting friends, etc and the accident is likely to happen close to the trip origin. Fuel system leaks and spills were present in 62% of the motorcycle accidents after the crash. This represents a significant fire hazard. The motorcycle riders involved in accidents are usually without training; 92% were self-taught or learned from family or friends. Motorcycle rider training experience reduces accident involvement and is related to reduced injuries in the event of accidets. 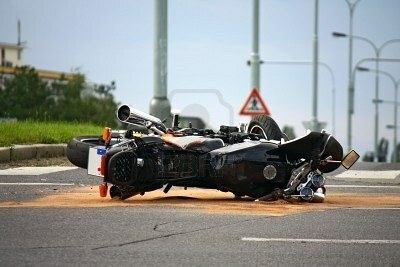 Injury severity increases with speed, alcohol involvement and motorcycle size. Motorcycles are small visual targets and are harder to detect due to other vehicles, or by road and weather conditions. Hazards that are only minor for an automobile can be a major problem for a motorcycle rider. These include potholes, oil slicks, puddles, and debris. Especially at higher speeds, the front end of a motorcycle may become unstable and begin to shake or wobble. Statistics and numbers are supported by research done by findlaw.com, motor-cycle-accidents.com, and the “Motorcycle Accident Cause Factors and Identification of Countermeasures” study conducted by the University of Southern California. Automobile insurance companies have many stipulations in their policies when it comes to accidents. Different circumstances, vehicles involved, and regulations broken will all effect their likelihood of financial assistance. It is critical to realize that you need professional legal help to deal with not just the party responsible for the crash, but with the insurance companies as well. If you or a loved one have been injured in a motorcycle accident, please use our free lawyer consultation service or call 1-800-603-6833 to see what your next legal steps are. All consultations are free of charge and will be answered as soon as possible.